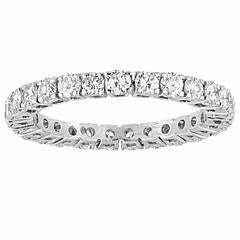 Beautiful Eternity Band with Alternating Round & Princess Diamonds The ring is 18KW Gold. There are 1.80 Carats In Round Diamonds G/H VS There are 1.70 Carats In Princess Diamonds G/H VS The ring weighs 5.4 grams The ring is a size 5.5, cannot be sized. 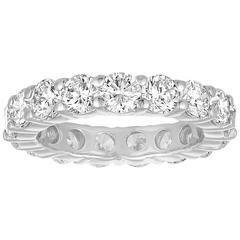 Beautiful Eternity Ring The ring is Platinum There are 3.50 Carats In Diamonds F VS The diamonds are round brilliant The ring weighs 6.0 grams The ring is a size 5, not sizable.